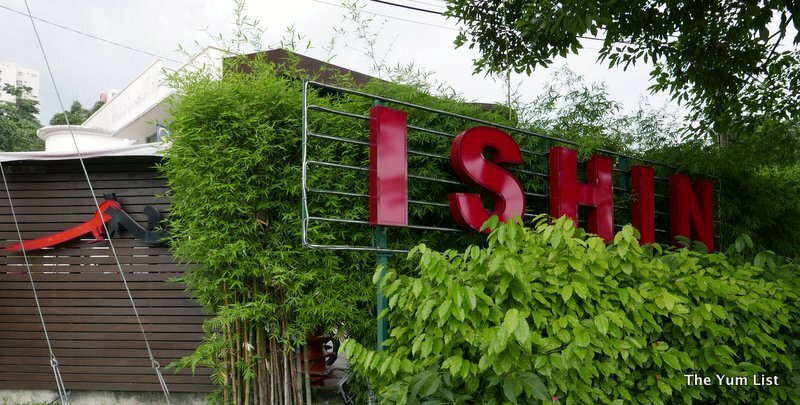 Ishin Japanese Fine Dining has been around or a few years. Some would say it’s a small landmark along Old Klang Road, not only for its great food, but also because of the 1950’s building it inhabits. Nestled just a stone’s throw from the busy road, Ishin is easy to spot with plentiful signage, and now has the benefit of free car-parking (just ask their friendly valet staff for help). Ushered upstairs to our table, the staff make us feel at home very quickly, and promptly offer us a choice of tea, as is usual custom. 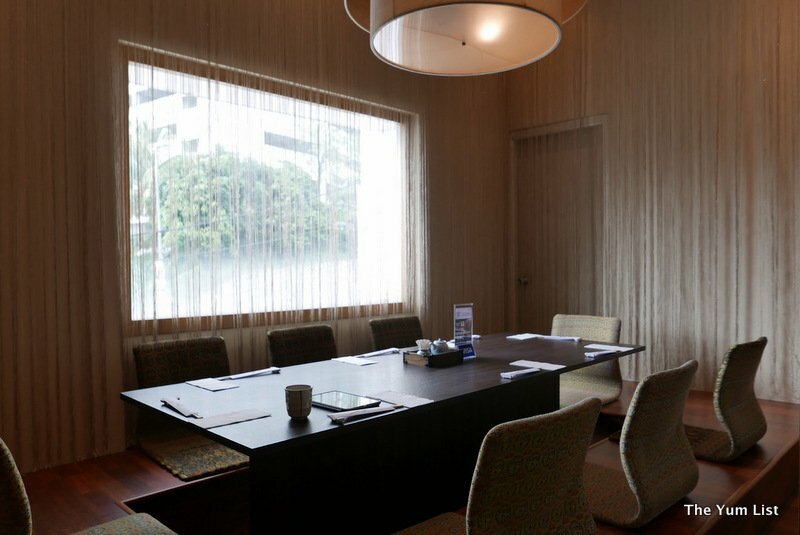 We had a small private room, with traditional seating arrangements. 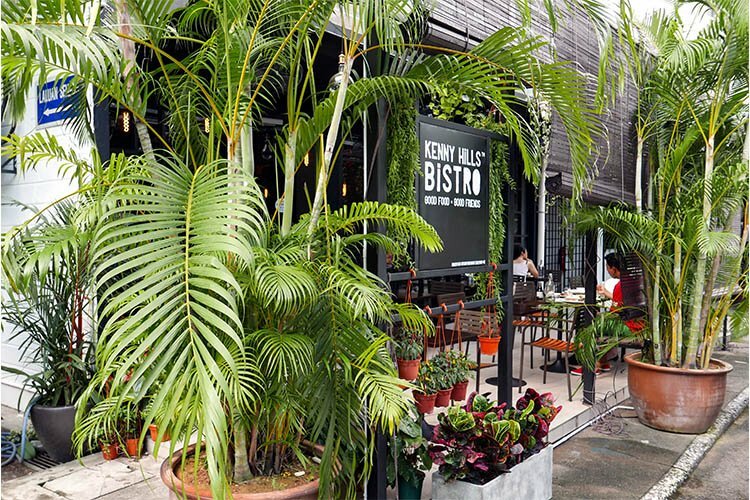 Double-glazing has certainly helped – despite being on one of KL’s busier roads, we couldn’t hear anything from outside – just the opportunity to look at the trees, and gaze a little further into the cityscape. Anyway, what we are here for; bring on the food! 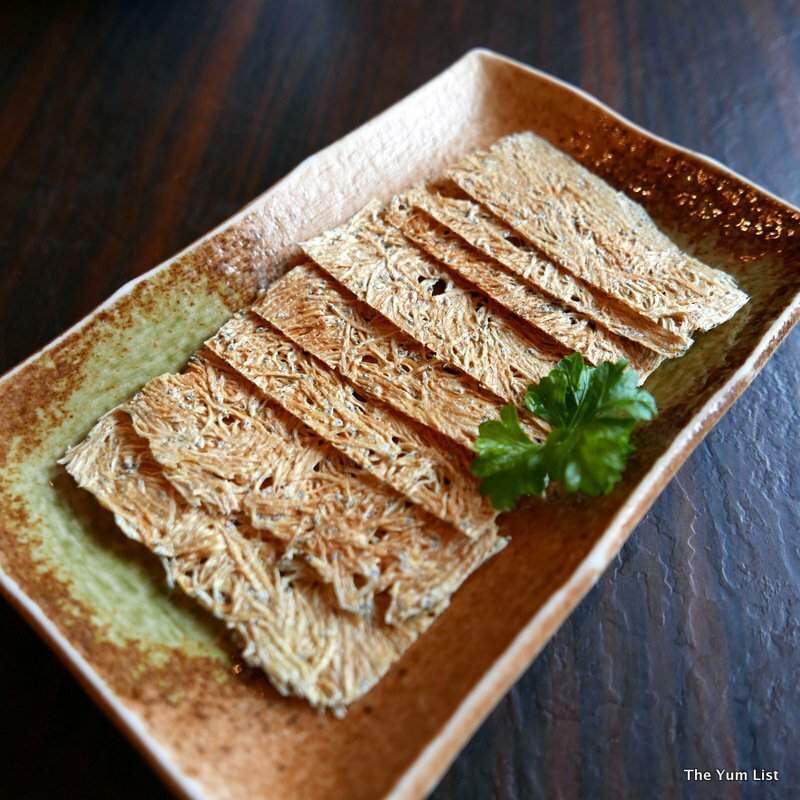 Our experience commenced with Tatami Iwashi – incredibly wafer thin, dry crackers constructed from grilled baby sardines. Add a hint of wasabi, and you have a moorish item to snack on, both before and during the meal. 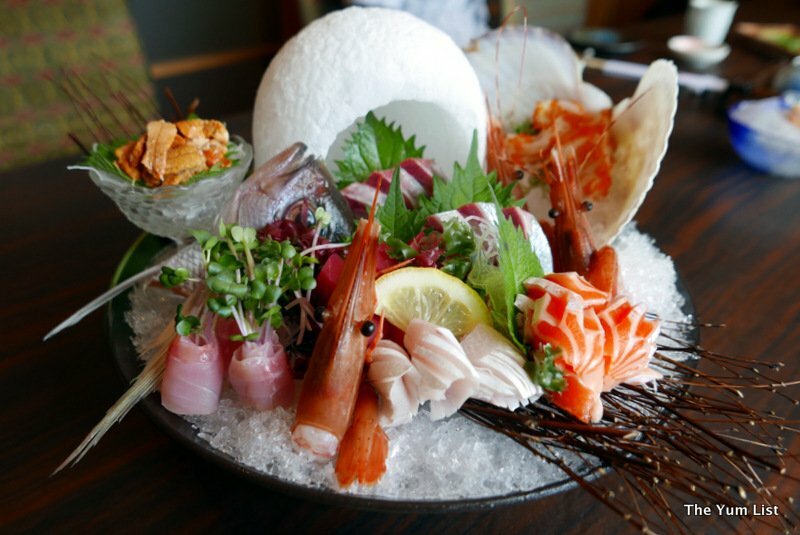 Ishin are proud of their fresh seafood selection – air flown in every Tuesday and Friday. We dined on a Wednesday, so the range was stunning. 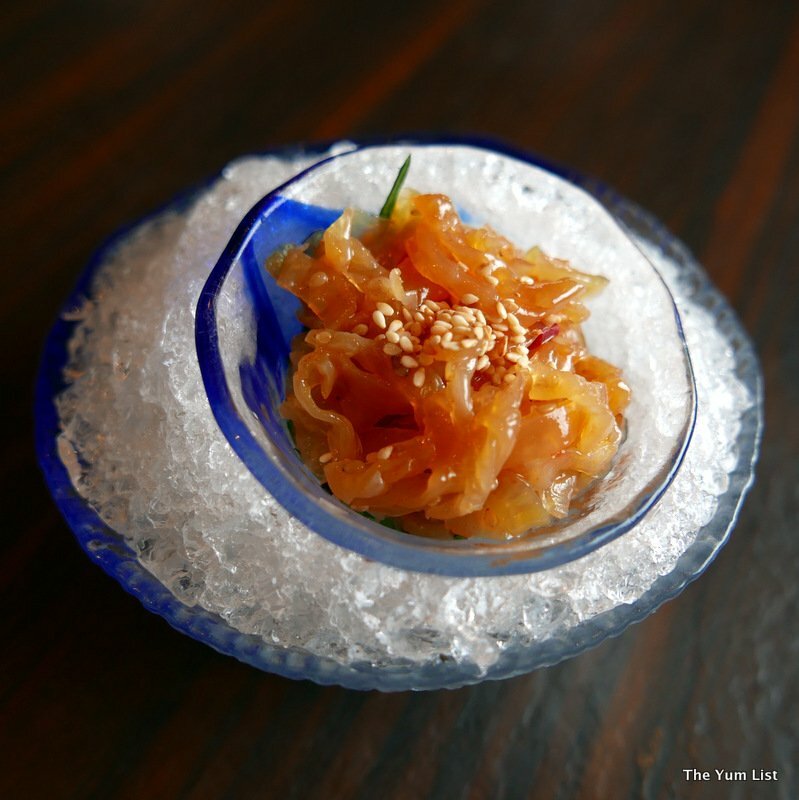 Jellyfish shreds, with a light sauce and sesame seeds, was our first introduction to their tempting seafood menu – this deliciously light starter was surprisingly crunchy. Our Chef’s Sashimi Platter comprised a plethora of delights: isaki, hamachi, hamachi belly, shake belly, uni, hotate, botan ebi and shima aji. 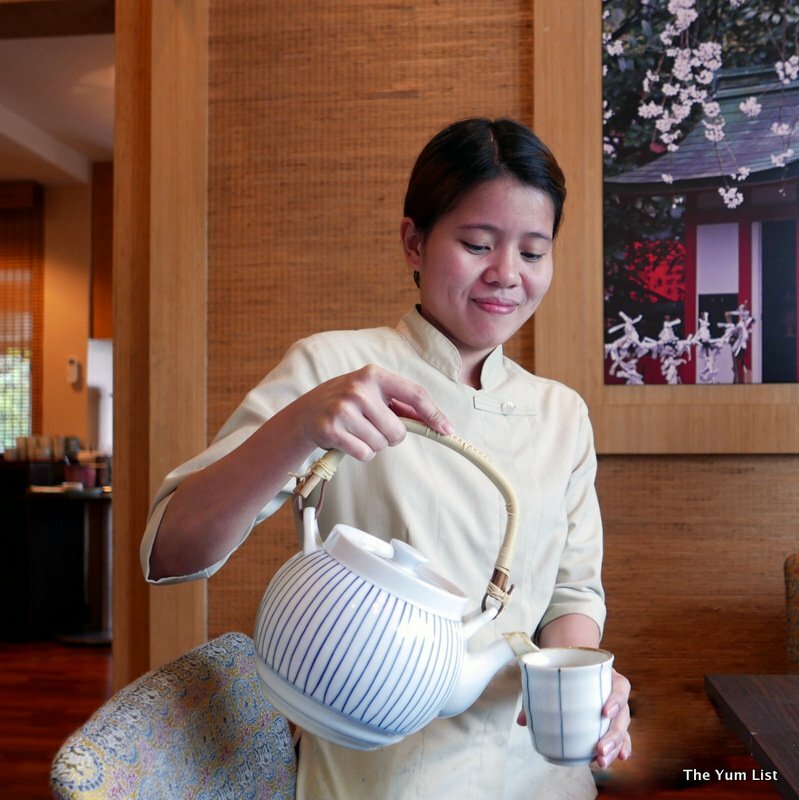 Chef threw in a very pleasant surprise – sea urchin. Definitely a first, and definitely not a last for me. For the Kiwis amongst our readers, it tastes like smoked roe; for others, you just have to taste it to experience it. Perhaps one of the scarier looking extractions from the sea, and certainly one to be a tad weary of, although the flavour is quite an acquired one, the sea urchin is in fact very light and creamy and for seafood lovers, an absolute must-try. The seafood is served on ice, and you can see that Chef takes great pride in using this medium to present elements of the platter, as well as to keep the morsels chilled and fresh. The carved ice cavern was a great touch. Absolutely everything on the platter is edible, including the fragrant misuna leaf (quite tasty really) and other greens. For those who like to add a little kick to their sashimi, just as I do, Ishin offers fresh wasabi. In fact, so fresh, that you grate it at the table yourself. 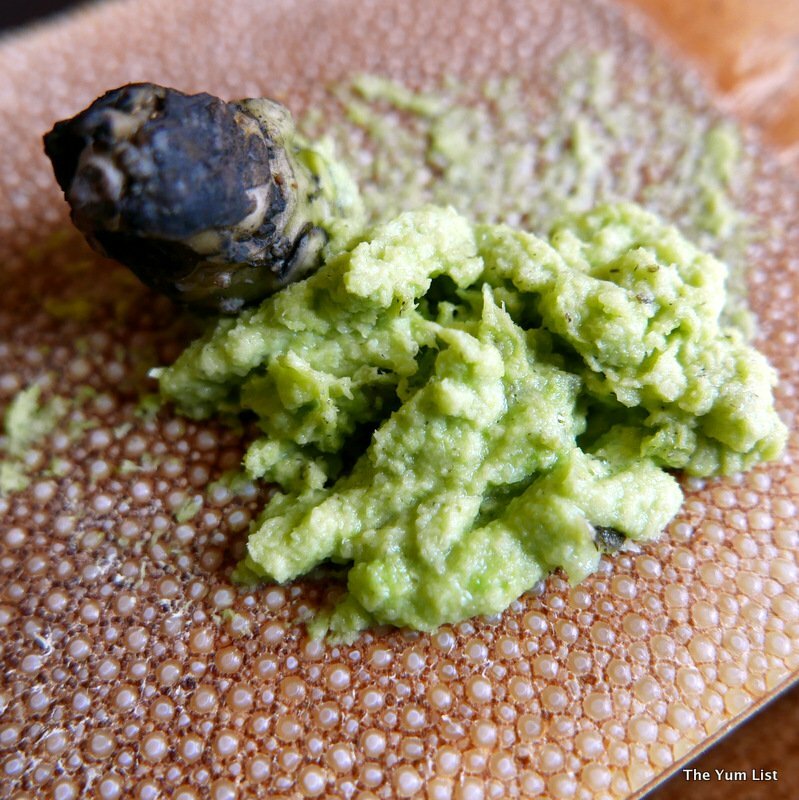 A small grating board, covered in shark skin (very rough texture), is used to grate fresh wasabi root into the powdery paste that we all love. It’s not as easy as you think – it actually takes quite a bit of effort to grate that wasabi to give the quantity one may want, but it is certainly fun watching others do it. Do ask the staff for help if you are strength-challenged (“lazy”) like me, as they are old hands at getting the job done well. 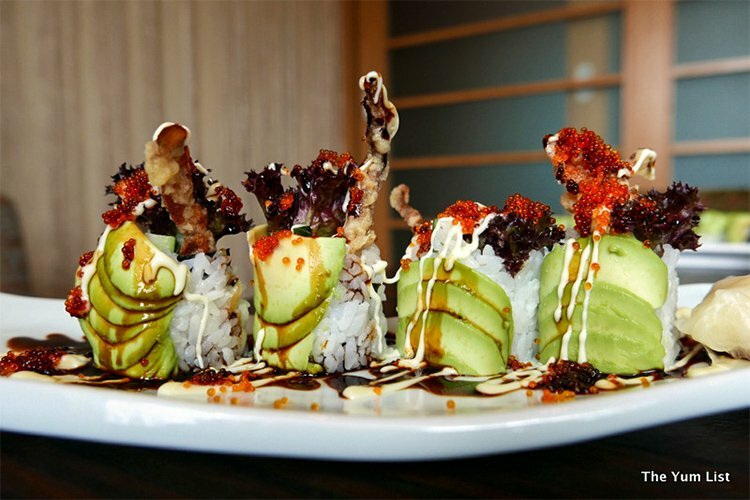 Keeping in line with the seafood theme, the Caterpillar Roll – soft shell crab sushi – was next. 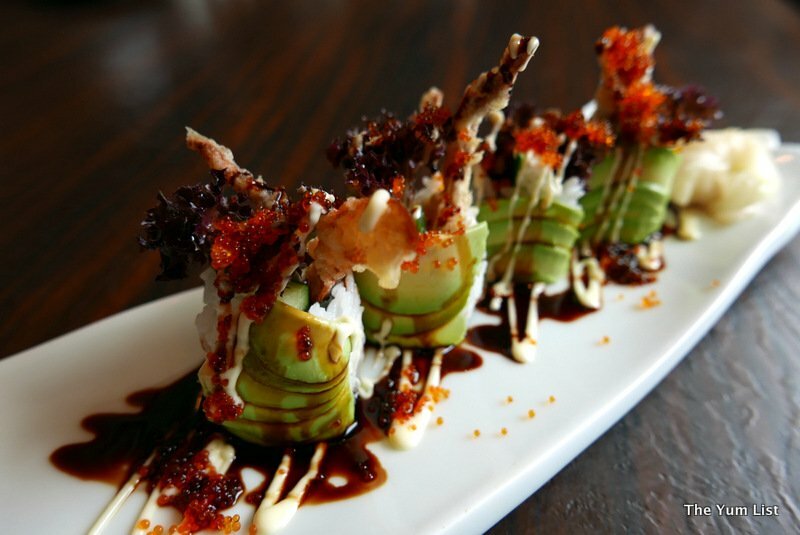 Wrapped in avocado (yummm), micro roe (double yummm), and iceberg lettuce, this sushi creation is light and delicate in flavour. Interestingly enough, the soft shell crab was served warm within the sushi, adding to the taste experience. Stepping it up a level, the Dragon Roll – unagi sushi – was a tad stronger – probably too strong for me. Wrapped in avocado, it tasted great, and I found myself going back for more. 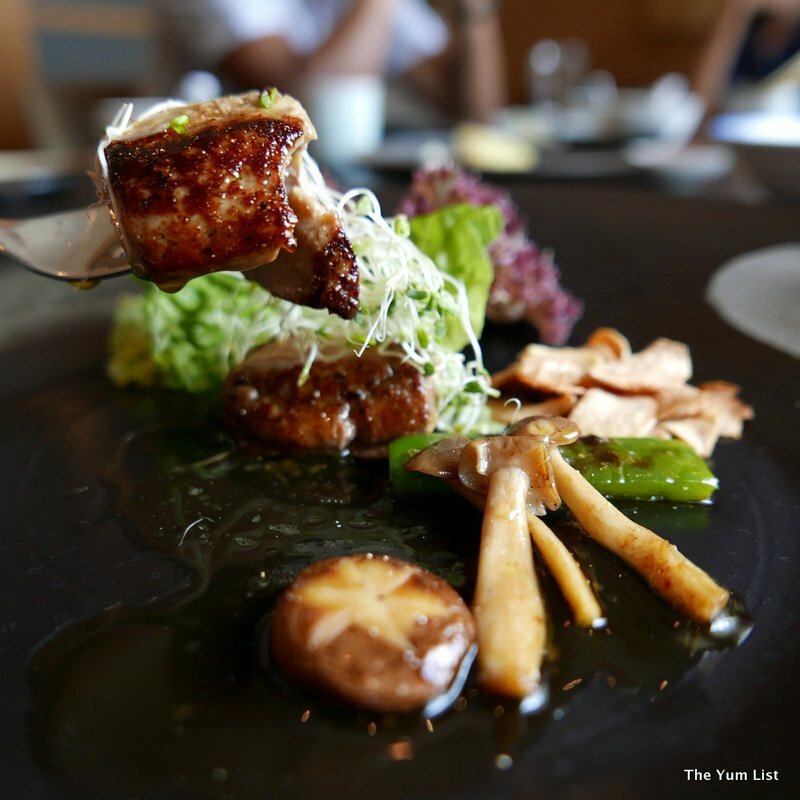 Regardless of my personal taste preferences, the quality is obvious, as is the care that Chef takes when crafting each plate of food as a story within itself. 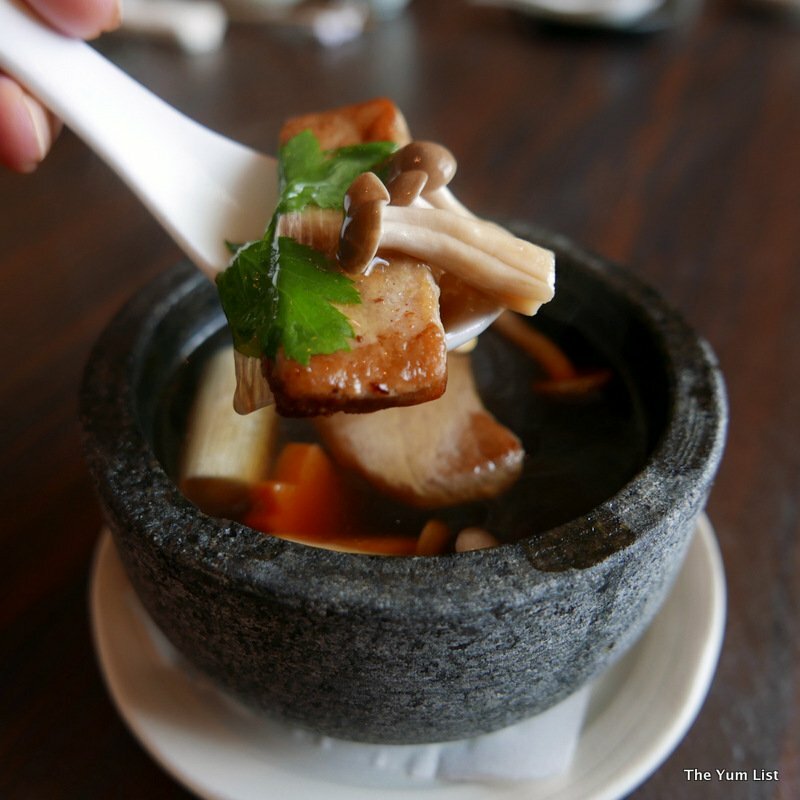 With steam rising from a stone bowl, the crystal clear broth of the Double Boiled Toro Soup crafted another special taste experience. Unexpected was the lightly fried fish fillet that was in the soup accompanied by carrot and mushroom. Piping hot is how soup is best served, and this light delight was certainly served to perfection. 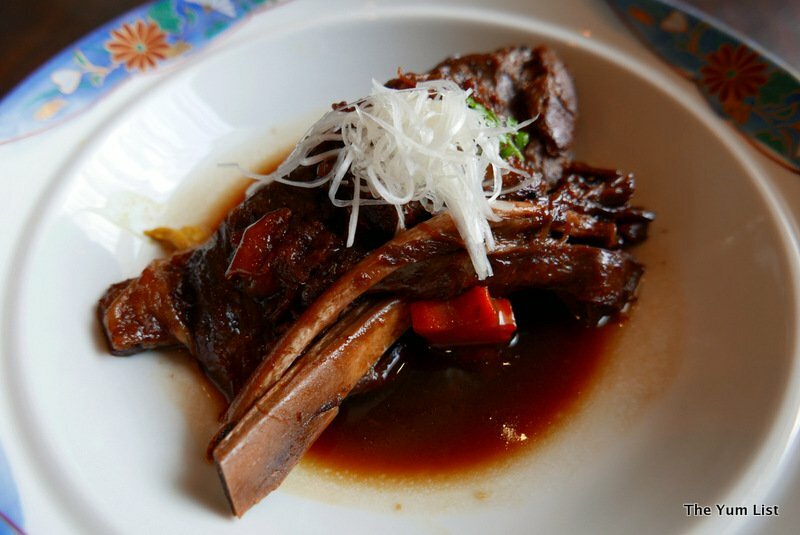 The Lamb Kukuni is an aromatic, slow braised lamb dish, reminiscent of a homely stew, which just fell off the bone. Superbly tender, and none of that overly-strong lambiness in its flavour. Accompanied by a silky sauce to add depth, and a dash of mustard on the side for those who like it hot. 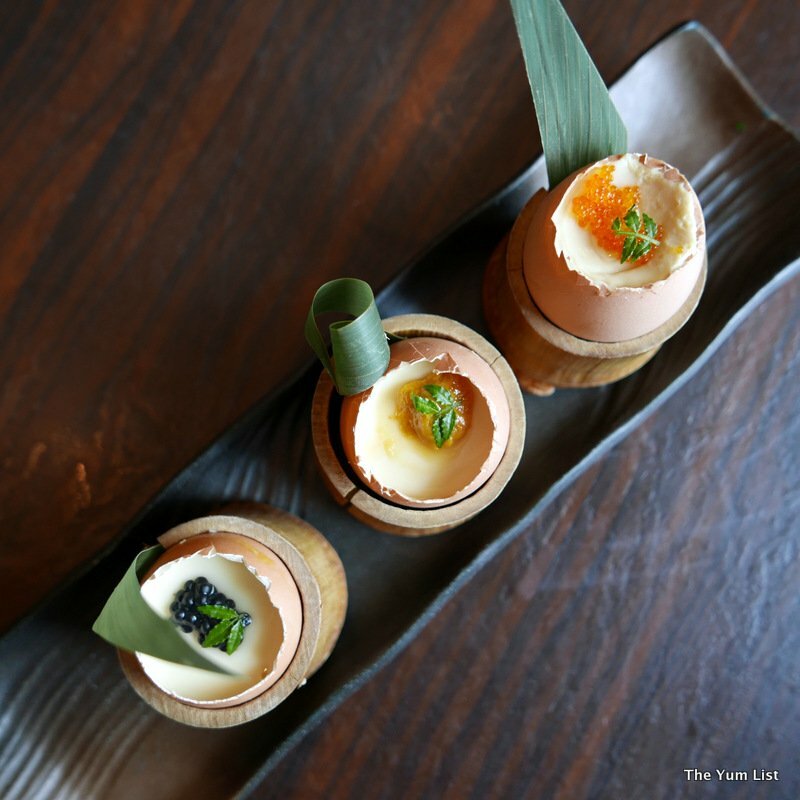 Served in whole eggshell, the Mini Chawan Mushi offered us a tempting selection of three flavour toppings. The egg was cooked to perfection with a delicate velvety texture. Great for those who want to explore a little – the toppings were uni, tobikko, and caviar. My personal highlight from the meal was the Duck Liver. Silky smooth duck liver, tender and lightly cooked to the point of melt in the mouth; this was a rich dish as expected, certainly extravagant, but delightful in all aspects. I could go home a happy man after just one plate of this. 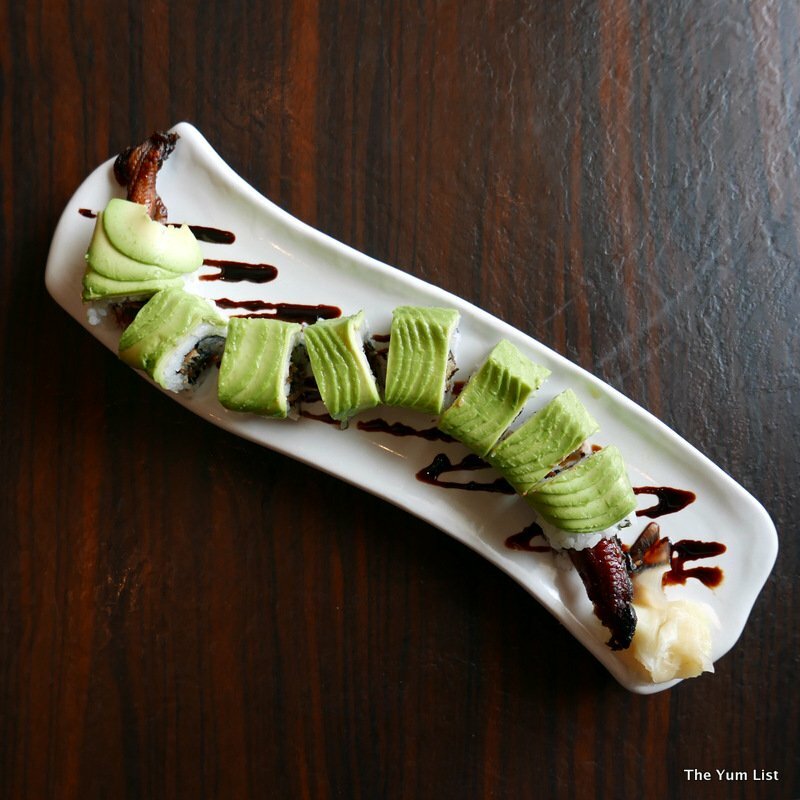 It’s hard to top a meal like this, but Ishin still had a few more surprises in store for us. 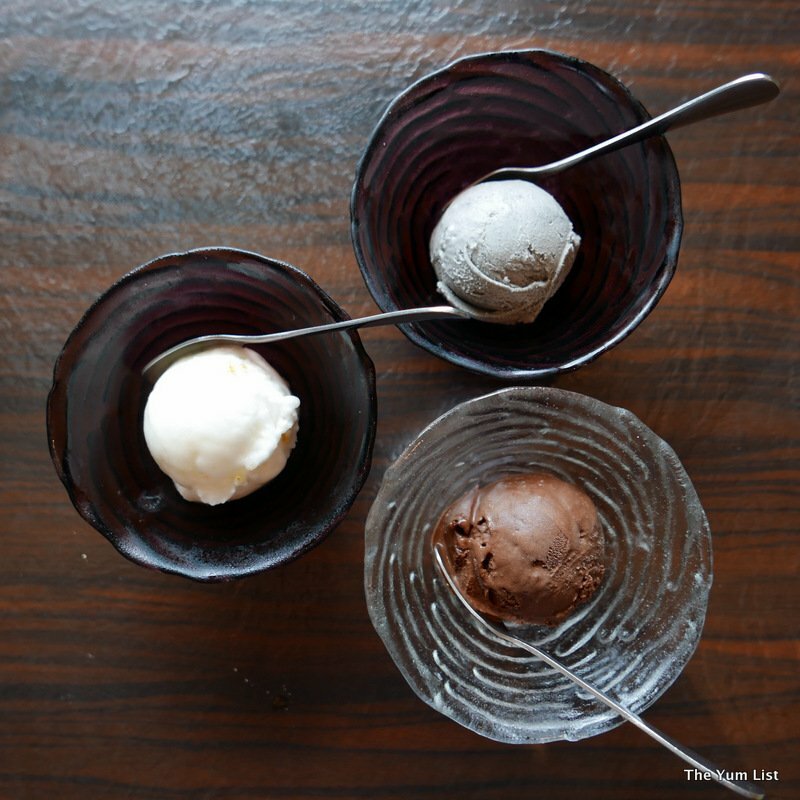 It was a culinary journey through their menu, exploring the variety of cooking techniques and ingredients popular to Japanese cuisine, but also stepping outside of the typical norm that we might otherwise experience. 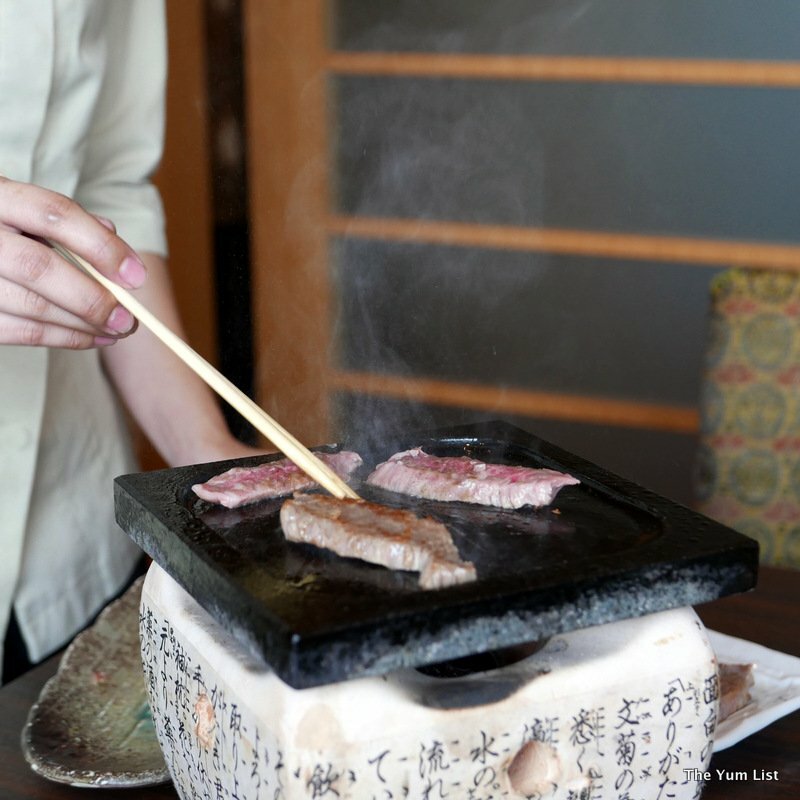 Wagyu Stone Grill, Ishin’s wagyu steak, is cooked on a hot stone over an open flame by their staff. A mini BBQ if one likes, but not one where you get all smoky. 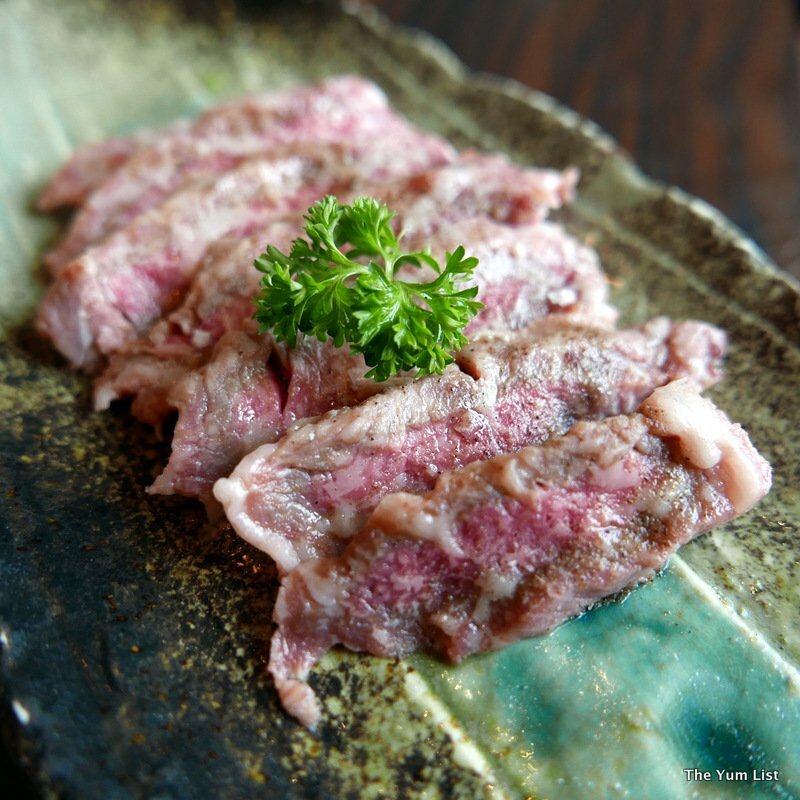 Beautifully marbled strips of wagyu were cooked to our preferred level of doneness, and when dipped in a simple concoction of miso and salt, simple perfection! 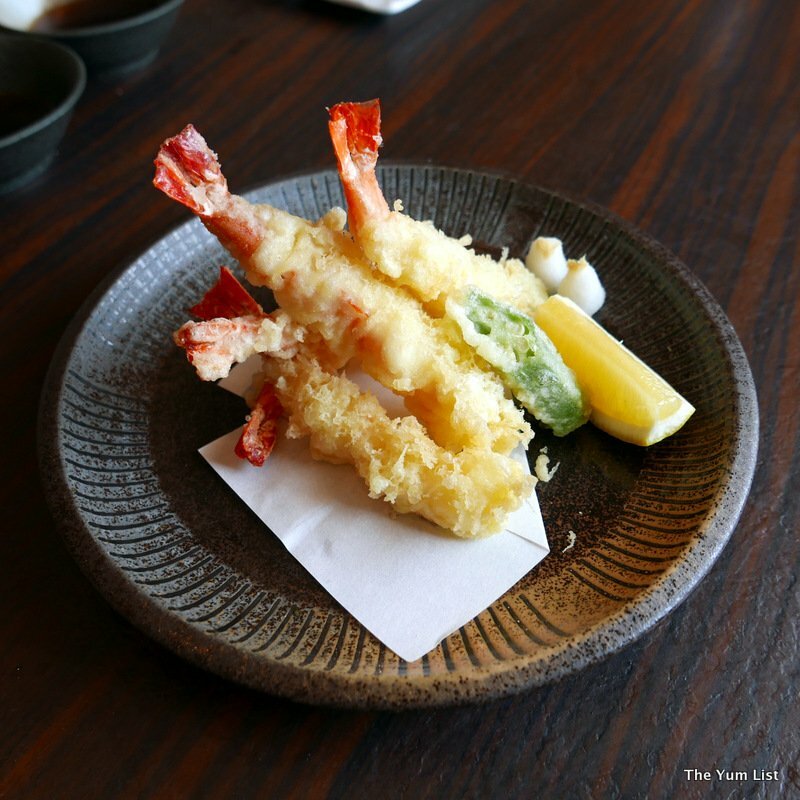 And to finish us off, and by this time, I think it was safe to say that we had eaten quite a bit – it all adds up – Ebi Tempura (tempura prawn). Huge tiger prawns, lightly dipped and fried in tempura batter until golden and crunchy, and absolutely sublime with a hint of wasabi (that one I added for my own taste buds). Just imagine succulent giant prawns, and you’ve got the idea! For those who prefer lemon, just a small squeeze and you’ve reached bliss. 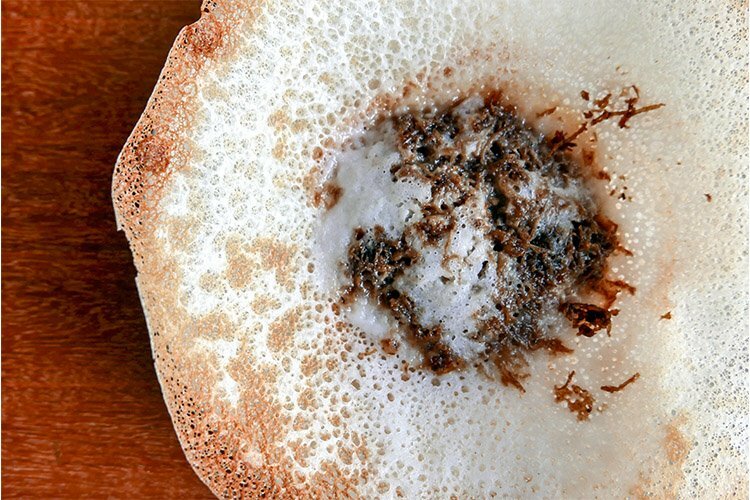 A must-have on the Ishin desert menu is the Raindrop Cake, something they are particularly proud of. 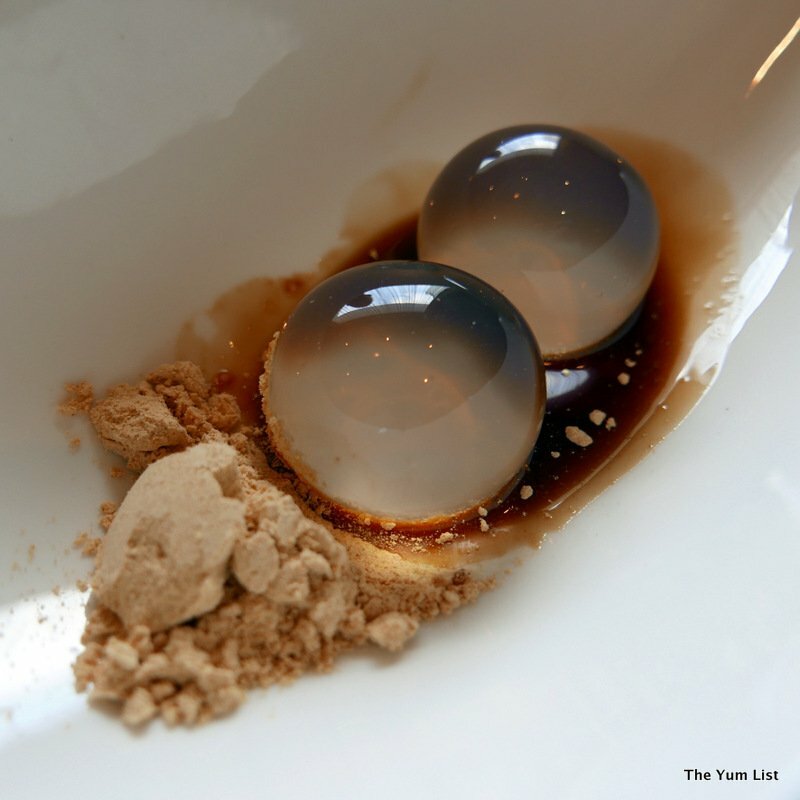 Translucent teardrops of jelly, dusted with fine sesame powder, and a light sugar syrup, give not only an amazing optical illusion, but an excellent taste experience too. So yes, that was a substantial meal, and an amazing journey through the culinary offerings of Ishin. Whilst everyone’s definition of fine dining is different, Ishin certainly delivers across the board – service, environment, presentation, quality ingredients, and innovation. The restaurant has an extensive range of Japanese whiskey too – although, for me, that’s going to have to wait for a return visit. Do give Ishin a try if you’re wanting to step it up a notch with your Japanese dining experience; reservations are not necessary, but always a good idea on Fridays and Saturdays. Reasons to visit: good private dining rooms; friendly and helpful service; don’t miss the sashimi platter, caterpillar rolls, lamb kukuni, stone grilled wagyu and the prettily presented chawan mushi. Thanks for the warm fuzzy Linda! The lamb is a great choice. Yum. You’d love this spot then Ken. Fish flown fresh, wasabi fresh, wagyu cooked fresh. Yes, this place is a winner! We thought so. It was also great for us to see something different on the ‘other’ side of the city. I like the wagyu stone grill. The raindrop cake is interesting. The boys loved the stone grill too. The rainbow balls were unique. They’re always so good with their hands at these Japanese places. Everything looks so beautiful!